Along her journey to figure out why she could be doing all the right things and still feel like something was weighing her down, Cara had posted a photo of a rhinoceros on a treadmill staring at a picture of a Unicorn as it ran. She made the image her profile picture because it reminded her so much of herself; running in place in pursuit of something you most likely will never be anyway. When asked about it by a friend one day, Cara told them her reasoning behind it and why it was the first thing you see when you go to her Facebook page. Her friend gave her a look like she was crazy and Cara couldn’t help but ask what it was in her explanation that warranted such a response. That subtly suffocating weight resting on her shoulders unexpectedly started to lift at that very moment. An epiphany clicked like a seatbelt connecting to a buckle. All this time she thought that her struggles cast an ugly shadow on life’s potential that lay waiting at her fingertips which kept her from reaching that happiness peak and basking in the sunshine of self-worth, when in reality she was every bit the “Unicorn” she aspired to be all along! The very things in her life she thought were responsible for cloaking her true beauty happened to be defining points of her shine and grace. We all know pain and struggle, yet to carry that back breaking load on your own with the assumption that you’ll never be “like the rest” is what holds most of us back from seeing the amazing spirit that lives in every single one of our heartbeats. In essence, we’re ALL Unicorns… We just don’t always see it. 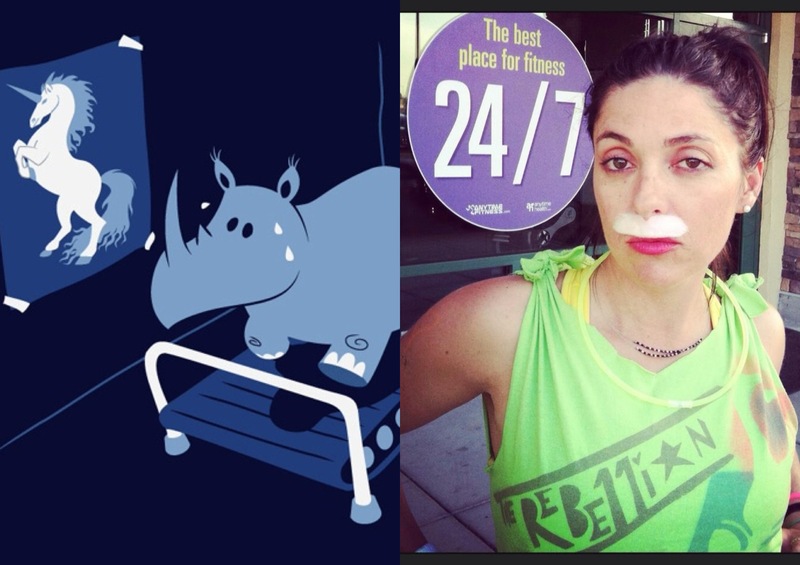 The rhinoceros wasn’t on a treadmill looking at a photo… it was looking in the mirror.